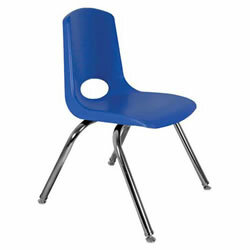 Supply your classroom with Kaplan's selection of high-quality wooden and plastic chairs. Kaplan offers stackable chairs in various heights, specifically designed for certain age groups and their individual needs. 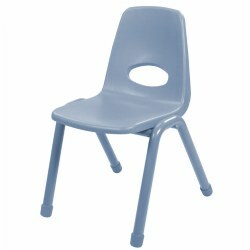 Highchairs, cube chairs, sofas, and desks help teachers find everything they need for their classroom quickly and easily. 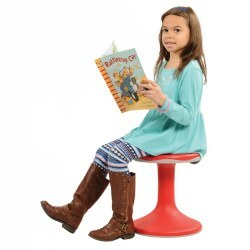 For distracted children or fidgety teachers, check out our K'Motion Stool, a flexible seating option for those that need movement to focus. 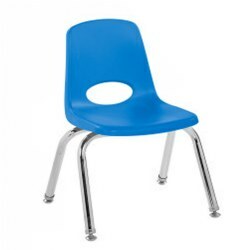 This chair makes a great addition to any classroom! Features molded K-Resin seat with vented back and reinforced ribbing in the back and seat for strength; 14-gauge, non-tapered, chrome-plated steel legs; and SuperGlide composite ball glides (70% polypropylene and 30% nylon) for greater durability and protection on hard flooring and carpet. Interstacks to save space. 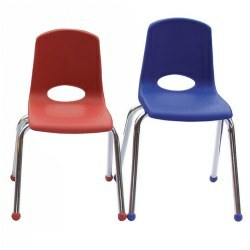 These chairs make a great addition to any classroom! Features molded seat with vented back, 14-gauge, non-tapered, chrome-plated steel legs, and SuperGlide composite ball glides for greater durability and protection on hard flooring and carpet. Stackable for saving space. Choose seating height and color. 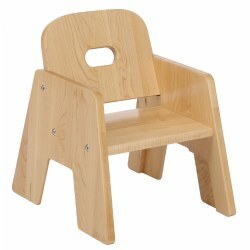 The only solid wood chair you'll ever need for your classroom or center! These hardwood chairs feature saddle seat, angled legs for stability, and front, side and back leg braces for strength. Classic ladderback design is an excellent accent to all room decor and features a curved backrest for comfort. Finished with a durable easy-clean laquer that protects against scratching and staining. Fully assembled. Choose seating height. 4 - 7 years. 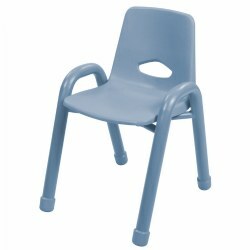 Innovative school stack chair features a molded seat with vented back, reinforced ribbing in back and under seat for strength, steel legs with steel lower back support. No penetration of screws through the seat surface. 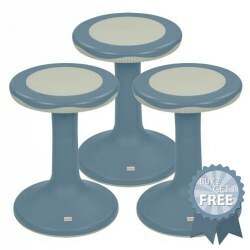 Available with nylon swivel glides perfect for hard floors. 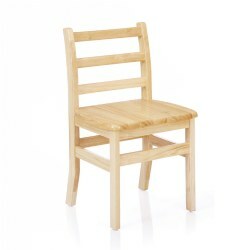 Chair measures 22 1/2"H x 15 1/2"W x 14 1/4"D.
Chair made of birch and constructed to be strong and durable. Features rounded edges and a finish that resists stains. Chairs are stackable. 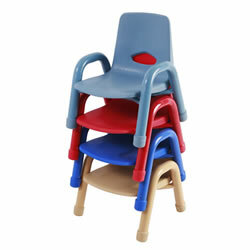 Sturdy stackable chairs with rounded design back for added safety and comfort. Wide leg bottoms for stability. Sold in sets of 2. 2 years. 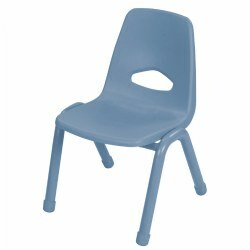 Tough, lightweight, stackable chairs with one-piece polypropylene shells and matching enameled steel frames and legs. Choose seating height and color. 2 years & up. These chairs are a perfect match to our Premium Solid Maple kitchen units, and the Premium Solid Maple Toddler Table and Chair Set (item #32262). Set of two 7' stacking chairs. Stackable chairs are made with rugged polypropylene shells and steel frames. Choose color and height. 12 months & up. The Cube Chair has three uses in one! First use it as a chair with either a 6" or a 9" high seat. Then flip it over and use it as a table or a seat for adults. 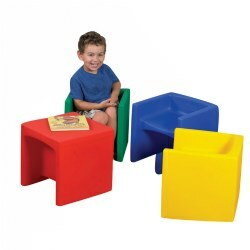 Our versatile 15" durable Cube Chairs are made of lightweight, molded, waterproof polyethylene, features safe rounded corners, and can be used indoors or outdoors. Measures 15" x 15" x 15". 12 months & up. The Adapta-Bench™ has three uses in one! First use it as seating with either a 6" or a 9" high seat. 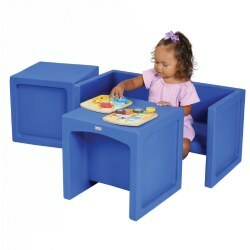 Then flip it over and use it as a table or a seat for adults. 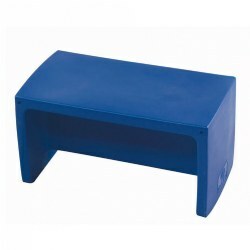 Our versatile, durable Adapta-Bench™ is made of lightweight, molded, waterproof polyethylene, features safe rounded corners, and can be used indoors or outdoors. Measures 30" x 15" x 15". 2 years - Adult. 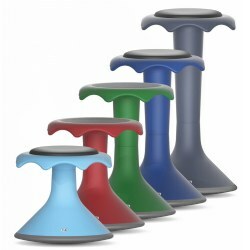 Tough, high-impact plastic stackable chairs offer comfort while providing firm back support. Heavy-gauge tubular steel frame includes non-marring, cushioned-swivel glide feet. 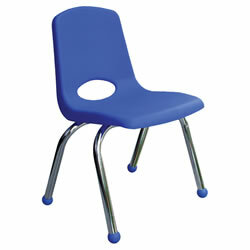 The 17 1/2" Teacher Chair has a weight capacity of 250 lbs. Choose seating height and color. 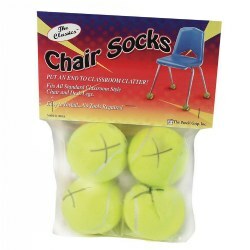 Keep the noise level down from hearing the chairs slide across the floor with our foot covers for your chairs. They protect your floor and reduces noise. 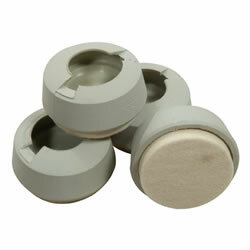 They fit 1 1/4" diameter high angle swivel glides and are easy to install. 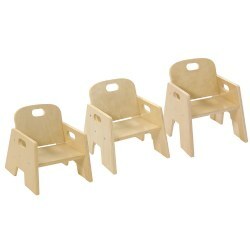 Available in a set of 4 sliders for one chair or a set of 80 sliders for 20 chairs. 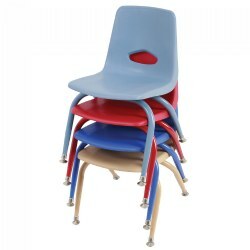 Stackable teacher chairs are made with rugged polypropylene shells and steel frames. 17 1/2" seating height. Set of 4 chairs available in Light Blue and Red. 7 years & up. 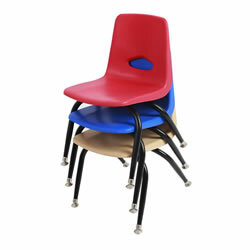 Stackable chairs are made with rugged polypropylene shells and steel frames. 15 1/2" seating height. Set of 4 chairs available in Light Blue and Red. 5 - 6 years. Stackable chairs are made with rugged polypropylene shells and steel frames. Arched legs provide handles. 13 1/2" seating height. Set of 5 chairs available in Light Blue and Red. 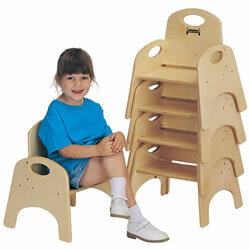 High Chairries are a smart and versatile choice for any early education environment. 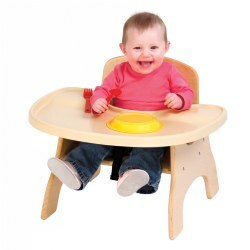 Designed to make feeding and clean-up a snap, the High Chairries feature a durable 22" wide x 17" deep stain-resistant, FDA Approved and BPA-free plastic tray that has 126% more surface space. The raised lip helps contain spills and can hold up to a half gallon of liquid. A removable and adjustable 3-point seat belt makes for easy cleaning and an excellent fit. Several seating heights to choose from.